Info en portugues: doc + pdf Lyrics here. MEETING POINT supposes one of the most shining and surprising debuts of the last times. It is the first CD from HYDE CASINO, they comes from Santiago de Compostela (N.W. of Spain) that "represent new psicodelia from Galicia" (Maketón - 40 Principales Network Vigo) and that with their hard and distorted guitars contributes a new dimension to their sound "we tried to escape of labels, simply we listen and make music". Recorded at Abrigueiro Studios and produced by Arturo Vaquero and Hyde Casino. In the disc you can find songs like "Dr Hyde" (1st hit single) with a surprising videoclip; "Magazine Woman"; "Boss Curse" or "Rescue".... it’s impossible to remain just one. They sing in English what it will facilitate its entrance in the rest of Europe, USA and Japan as another hit bands from Flor y Nata Records. "Magazine Woman" is an exciting vs. from a Gary Walker & The Rain song made in 1968. Even Walker say “I like it” when he listen the song, or "Find & Seek" that will surprise to Graham Day, its author. Artefacto Producciones have been in charge of the production from the videoclip from “Dr. Hyde” and the cover of the CD. 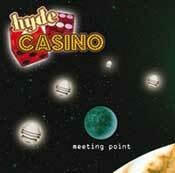 Although with experience in previous bands, HYDE CASINO was formed in December of 2006. Without any change from the beginning, they are Fer (voice and guitar), Juan Yeyé (drums and choirs), Gon Gurú (bass) and Xulio Lens (keyboards). The press agrees in which their sources are in british psicodelia: "they lay the foundations its music in rock'n'roll to shake everything with good doses of 60’s psicoledia. They must have listened The Who, the Rollings and the Doors, any doubt about it" (Vinilo Valencia). In his more recent stage like a demos band, still with the name of "Dr Hyde", was able to call the attention of Julio Ruiz whom it programmed to them in Radio 3 and of also Pilar Arzak that praised its song "Rescue" (included at Meeting Point) in its program "Peligrosamente Juntas”, of Radio 3. Two of the songs of their demo will be at the compilation "Megatón Ye Yé" Vol. 12". MEETING POINT is the departure point of a race that guesses brilliant, intense and full of good songs, these 10 are just the beggining, You you are going it to lose?